The geography of AirBnB – where next? Eoin O’Mahony, UCD and TCD. This morning, I read that Dublin City Council have finally published their report on the impact that AirBnB is having on Dublin City’s housing. One of the more significant reported findings is that there are many individual people renting out multiple short lets. Downey’s report for the Council (which I have yet to read) recommends that two Council committees work together to figure out a way to “tackle the issue”. While we await the Council’s prognostications, let’s examine some of the impacts that the most recent batch of data (February 2017) points to. 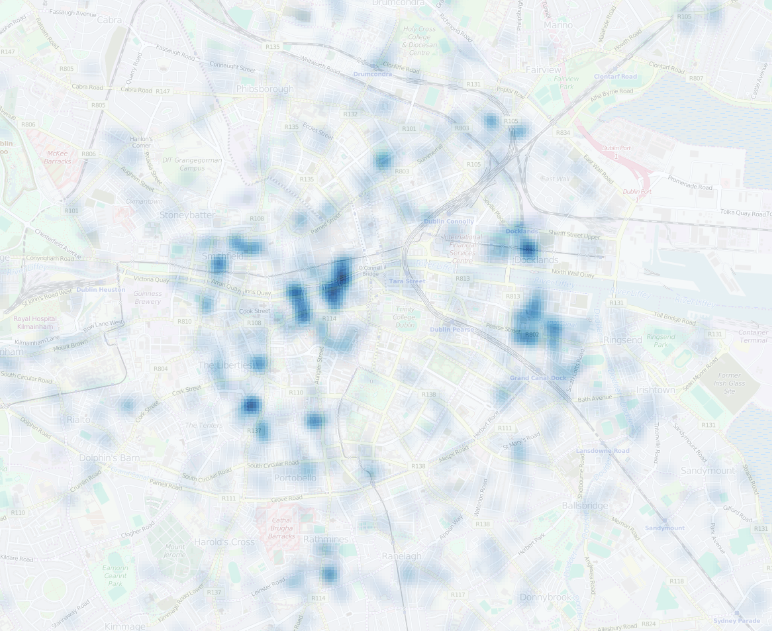 This is a kind of geography of AirBnB in Dublin, a way in which to help analyse the current housing crisis. This is the housing crisis that Coveney would like to solve part of before June, you know, after winning the leadership race of his party. Priorities, right? Firstly, within the City Council area, there has been an increase in the number of listings between August last year and the February scrape. In August, there were 4,931 listings for the city area – the vast bulk of all Dublin region listings. By February, this had increased to 6,729, an increase of 36%. There must be few other things in the city that have increased by this amount in this period, except perhaps seagull droppings. There has not been a 36% increase in the output of social and affordable homes in the city over this period. There is clearly a number of people out there who have apartments in the city who know that if they rent the spare room or the whole apartment they can make some money. Short-term lettings like these allow people the flexibility to rent some weekends and not others but also to pay a mortgage on a second (or fifth or eighth) rental property they just happen to have lying around. It beats having long term tenants it would seem. Perhaps significantly, the proportion of listings that rents the whole property out (as opposed to a room) has remained stable at 47% of all listings. So where are these listings located? the location for a listing on the map, or in the data will be up to 150 metres from the actual address. listings in the same building are anonymized by Airbnb individually, and therefore appear “scattered” in the area surrounding the actual address. I would be interested to see how Downey may have compensated for this in his report for the Council. Any point-in-polygon analysis is therefore compromised by these two constraints. Knowing this, what spatial patterns can we see? The average number of listings per ED is about 34. In the first map below we can see the distribution of listings below, around (±10), and above the average. Edit: dynamic map is now available here. The parts of the city that have above average listings include the docklands, the north inner city around Mountjoy Square and near Stoneybatter. By the far the largest concentrations of listings are seen south of the river, particularly in the south docklands and around Temple Bar. Focusing on those EDs with 100 or more listings, it is clear that the areas south of the river have many more listings than those north of it. This may point to a greater availability in these areas. Interestingly, the gap between in the southside of the map above contains the areas fancifully known as ‘the Georgian core’. The sabre-shaped ED known as South Dock has well over 300 listings. This takes in an area including the south docklands as well as the area immediately to the south and east of Trinity College. In and around the City Council building on Wood Quay is an area of high concentrations. Thanks to a suggestion by Martin at NCG, I then normalised these listings data by the number of housing units per ED from the 2011 Census. This gave a slightly different geography to the listings data. The average per area is a little under 2% of all housing units. Again, I classified the normalised listings data by below, around and above average but have not displayed the below average areas. We can note a number of differences, as is clear from the final map below. 13% of the units in south inner city are listed as AirBnB-available units. About 9% of the units South Dock are. The Georgian core comes back into play. The heaviest concentrations of listings are therefore found in the south inner city, heading west. I would like to read Downey’s report on this before I do any more work on these data. What’s not clear to me of course is if the Council is going to take any concrete actions to at least curb the power of property to yield profits in the middle of the city’s worst housing crisis. As Lorcan Sirr has indicated recently, some in control of this city have a strange relationship of denial with data. Action would require the Councillors to push back against the primacy of private property so you know…..not much will happen unless we organise like they’ve done in Barcelona and elsewhere. Dublin is so caught up in a maelstrom of ‘hyper-competitiveness’ that it barely has time to even think about what it is or what it means. At the centre of this is the tech industry, which influences everything from livable city agendas to housing discussions. It is a form of competitiveness that is presented in manner that makes it seem almost matter of fact or inevitable. When faced with this, the responses to recent announcement that the up-coming Web Summit will leave Dublin come as no surprise. The common mantra from various media sources (here and here) is one of ‘loss’, ’embarrassment’, and a sign that we must improve our infrastructure to cater for and attract events such as this. In a manner that would seem almost absurd to many, The Irish Times even went so far as to publish an opinion poll asking ‘Is the loss of the Web Summit a blow to Ireland’s reputation abroad’. In as much as such approaches are so dominant, it becomes completely accepted that the response must be for Dublin to reaffirm itself and ‘stay in the game’ or lose out. There is little reflection on what the level of mobility and ‘choice’ afforded to contemporary companies or organizations means for the city and for thinking about long-term sustainable approaches to economic development. If Dublin is playing a competitive game, it must be prepared for the possibility of losing out from time to time. It might be said that this is a small blip that we can recover from through the means outlined above. Yet, in so doing it must be remembered that in an industry that craves newness and innovation at every corner, a new venue every few years might be an inevitability, no matter how much is spent on infrastructure. In pushing the argument a bit further, we might also ask what might happen if this is just a pre-warning of an over-reliance upon the tech sector for the future economic viability of the city. We are playing an extremely fickle economic game and we need to brace ourselves for the possibility of failure based on overnight decisions for companies to move their location. Ireland is all too used to rapid economic busts, yet in entered into a game that is perhaps more unstable than the last, we remain blinded by the lights. It is time to stop pandering to the mantra of ‘what they want, they get’ – who ever the ‘they’ actually are. It is time to turn around and actually really debate what it is we want as a city and ask how, in this example, the tech industry going to contribute to this – in the long-term. If nothing else, it is time to realize that in reality the hyper-competitive city is a fleeting and unstable entity with unpredictable outcomes. Does Dublin’s Core Economic Area need three rail links between the Docklands and Heuston Station/Inchicore? 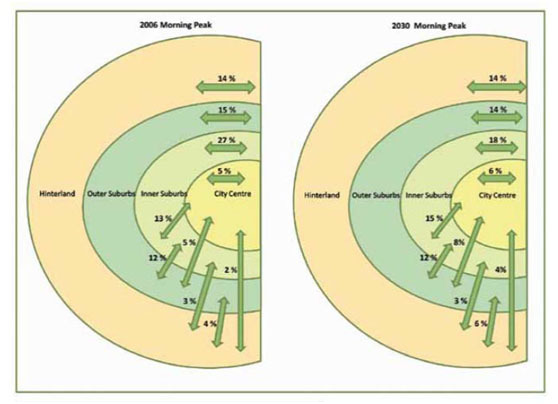 The planning of Dublin’s transport should be founded on a clear sense of priorities, based on (a) travel patterns and population, (b) the optimum use of resources available eg. street space, land use, finance, (c) investing in sustainability. One would expect the National Transport Authority (NTA) to pay particular attention to the implications of the data in reports it has commissioned. However, recent work by the NTA pays scant regard to the public transport needs of those living between the City Centre and Dublin Airport. Despite NTA evidence, there is still an obsession with a City Centre-Airport rail link and journey times on this corridor. An NTA report has shown travel demand is greatest inside the M50 during the morning peak ie. 1. between the canals and the M50 – the Inner Suburbs – with 27% of journeys in 2006 and 18% in 2030; 2. inside the canals – between the Inner suburbs and the City Centre – with 13% in 2006 and 15% in 2030. (see Figure 1). 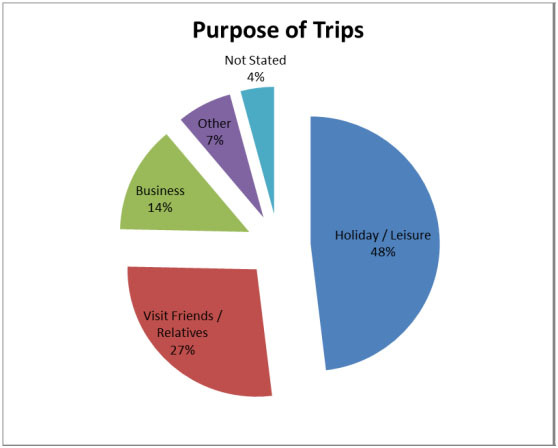 This travel demand reflects activity in Dublin’s Core Economic Area as shown in Figure 2 (prepared by Justin Gleeson, based in Maynooth University). However, in its do-minimum planning for enhanced public transport, the NTA has not focused on Dublin’s Core Economic area. 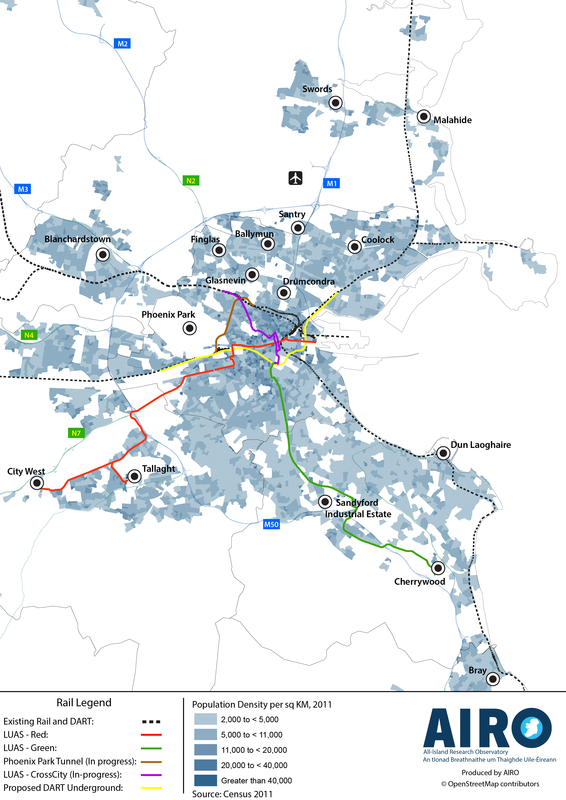 The NTA’s current Do-Minimum assumes DART Underground (the Yellow line on the map) as well as Bus Rapid Transit (BRT) to link the City Centre with the Airport and Swords. Neither will enhance public transport within the Core Economic Area, nor enhance access to the Airport from the central business district. This is a proposed 8.6km line from Docklands to Inchicore, mostly tunnelled, costing up to €4bn. This will add another rail link between the Docklands and Heuston/Inchicore. These areas are already linked by LUAS (Red line in Figure 2). There will be another rail link between these areas when the Phoenix Park rail tunnel (Orange line in Figure 2) is opened for use by commuter trains in 2016. It is not at all clear this €4bh investment will enhance development potential. Much of the DART catchment (dotted line along the coast in map) area is coastal. DART Underground itself will not improve public transport links between the Airport and the Central Business District. An NTA 2014 Route Options Assessment on the Swords/Airport-City Centre BRT shows that, with one exception, passengers forecast exceed the proposed BRT capacity. This report assumes that the present bus network will still be in place. This means that regular bus services will still run on the same roads as the two separate BRT services on the Dublin Airport/Sword-Drumcondra-City Centre route. This report also states that It is anticipated that demand will increase following a reorganisation of Dublin Bus routes. being diesel powered, it contributes to air pollution and thus damages human health. 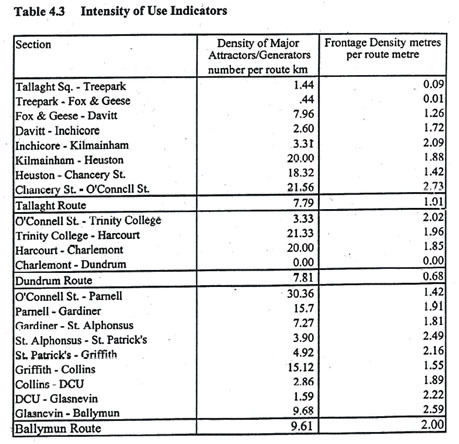 NTA commissioned yet another study to appraise longer term options for Fingal/North Dublin (NTA AECOM November 2014). A key criterion in assessing options is the journey time between the Airport and the City Centre. Less than one third of the trips originated in City Centre/South part of Dublin City. This suggests that the vast majority of passengers using Dublin Airport may not be very time-constrained in how they access the Airport. Most passengers are not bound for our capital’s Central Business District. Those passengers who are time-constrained have the option of taxis (which can use bus lanes) and/or using the Dublin Port Tunnel to access Central Business District. Consequently, in assessing options for public transport in north Dublin, travel times between the City Centre and the Airport should not be the sole or even the major criterion. The NTA is pursuing a do-minimum strategy for that part of Dublin’s Core Economic area between the Royal Canal and the M50. 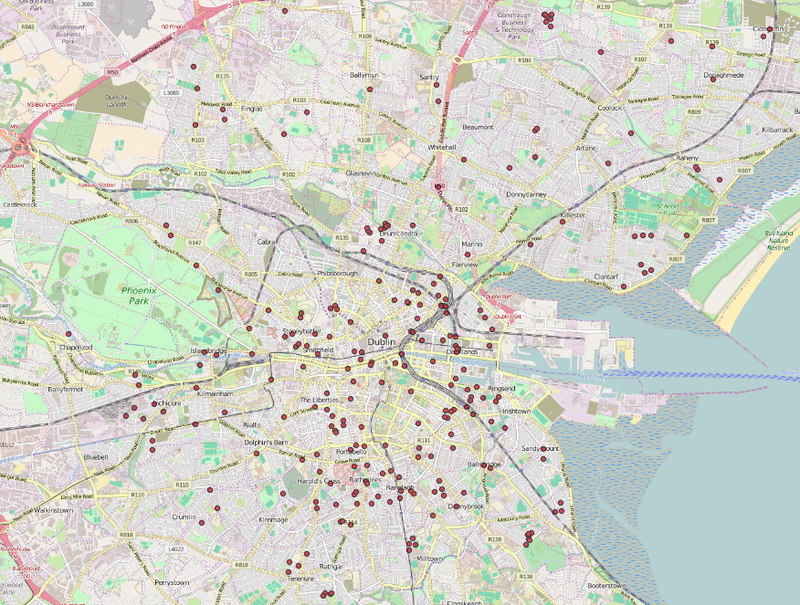 It seems to be forgotten that more people live in the north part of Dublin city (306,425 in Census 2011) than in either the south city (221,186), Dun Laoghaire/Rathdown (206,261), South Dublin (265,205) or Fingal (273,991). This has been so over the past 20 years, as is clear from Figure 3. The singular focus on BRT shows that the public authorities have learnt very little from the first LUAS line from Tallaght to Abbey Street. The late Judge Sean O’Leary was the Inspector appointed by the government to consider for the first LUAS planning applications. In 1998, he reported that “Having considered the evidence, the Inquiry is satisfied that in order to create similar condition of loading and unloading, ease of access and certainty…. that buses do not represent a viable alternative to the proposal” (for on-street light rail). The BRT Core Network Report supports this assessment. 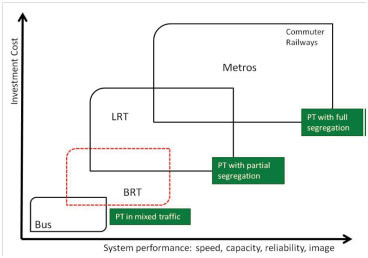 A comparison of the passenger carrying capacity of BRT with light rail and metro summarised is shown in Figure 5. 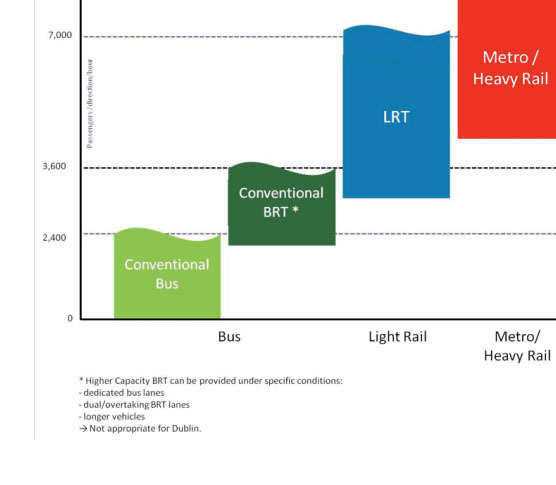 Note that this states that higher capacity BRT is not appropriate for Dublin. 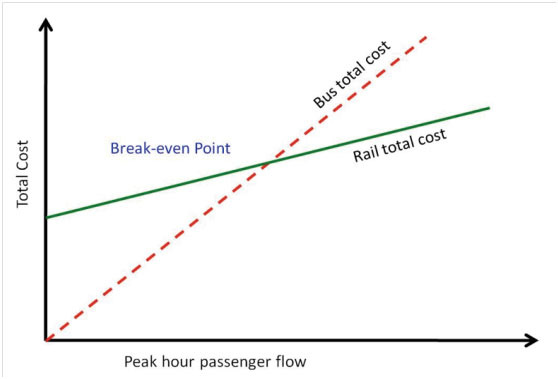 Comparative investment costs for different public transport modes are indicated in Figure 6. Neither the proposed BRT nor the single LUAS line on the route now advocated by the Railway Procurement Agency (see Sunday Business Post 3 May 2015) can provide sustainable public transport for this part of Dublin. This proposed LUAS line goes under Glasnevin Cemetery in a new tunnel. This adds to the cost of a LUAS line that will not serve the centre of Dublin’s north city core economic area shown in the map. Moreover, it is well away from important major trip attractors/generators eg. Mater Hospital, Mountjoy Prison, Croke Park, St. Patrick’s College, Whitehall, Santry, Beaumont Hospital. This RPA proposal ignores the results of a 1996 Dept. of Transport report which compared three LUAS lines then being considered. It is clear from Table 2 that a LUAS from the city centre through Drumcondra to Ballymun had much better potential for passengers than the two LUAS lines which were actually built. This confirms the results of recent NTA work which suggests that passenger demand can best be met by an on-street LUAS line for this central route in the north part of Dublin’s Core Economic Area. Table 2: A Comparative Socio-Economic Evaluation of the Tallaght-Ballymun/Dundrum Light Rail Lines. Final Report 1996. Oscar Faber. Source: Department of Transport, Energy & Communications. 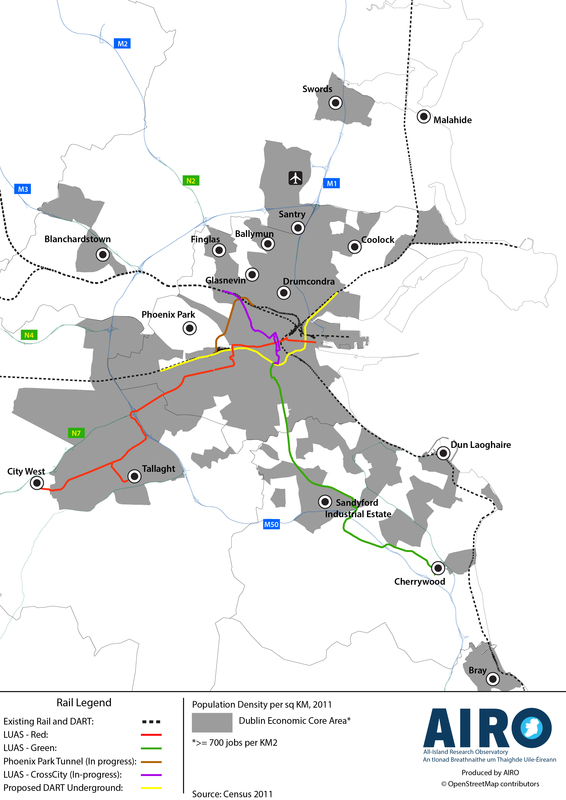 A Comparative Socio-Economic Evaluation of the Tallaght-Ballymun/Dundrum Light Rail Lines. Final Report 1996. Oscar Faber. NTA notes that the higher investment costs of light rail(LUAS) are offset by lower operation costs. (see Figure 7). Light rail (LUAS) vehicles carry more passengers than buses. Thus less drivers are needed than for bus-based systems carrying the same number of passengers. Buses have a shorter life than LUAS vehicles, even if the maintenance costs are higher. Buses are also less energy efficient and pollute more at point of use. A Docklands loop to link the existing Green and Red on-street LUAS lines as put forward by the Dublin Transportation Office in 2002. Our public authorities are still using arbitrary criteria for planning public transport. The feuding public sector baronies are still stuck in the property development whimsies of the early 2000s. This is not the evidence-based transport planning which Robert Watt (Secretary General of the Department of Public Expenditure and Reform) claimed as an example of civil service reform. (Commentary on public service reform is mired in the past Sunday Business Post 22 February 2015). We deserve better. To promote competitiveness and social cohesion, Dublin needs integrated and sustainable public transport. Achieving this needs quiet, consistent competence to bring working and living conditions to the levels of well-run European cities. It would be a start if our public authorities drew the appropriate conclusions from their own reports and invested accordingly. Donal O’Brolchain lives in Drumcondra, Dublin 9. He has been active in residents’ association for the past 25 years. As Secretary of Drumcondra 2005, he led residents’ support for the Dublin Port Tunnel during the 1990s, as part of a set of mutually reinforcing measures to improve transport in Dublin. 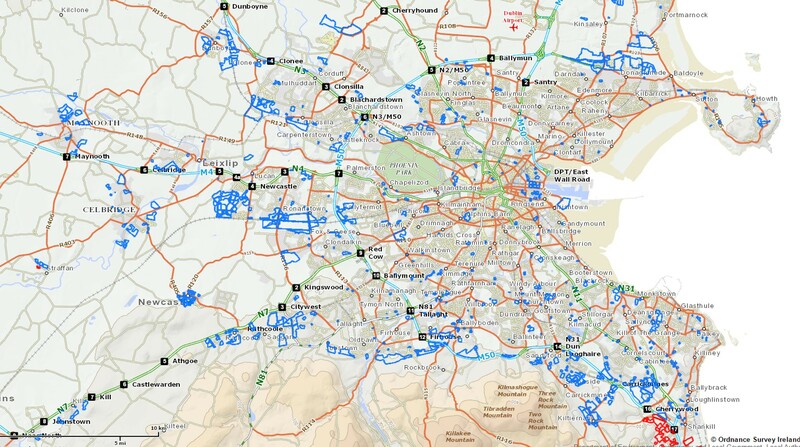 This included a core light rail/LUAS system in Dublin. This support was to implement a local area plan for Drumcondra district which seven residents’ association commissioned and funded from their own resources. This was launched in 1994. One of the great innovations of the past few years has been the increasing availability of spatial data. User-friendly and freely accessible online interactive tools such as Myplan and AIRO provide easy access to a wide-range of mapped datasets and other resources to help inform policymaking, research and those commenting on matters of public interest. However, despite this, the problem of what Carol Weiss refers to as the ‘problem of little effect’ remains i.e. that a great deal of this evidence tends to sit on the shelf (or on the web) completely unnoticed and has, in fact, very limited impact on policy debates. While this simple supply/demand thesis may, at first glance, appear convincing, it is undermined by one basic flaw. Throughout the Celtic Tiger period there was in fact an enormous surfeit of zoned residential land within Dublin and its environs. An audit carried out by the DoECLG in 2010 found that a total of 3,302 hectares of undeveloped residential zoned land existed within the four Dublin local authorities. Even with conservative residential densities of 35 units per hectare, this was sufficient for at least 115,000 new homes. Within the adjoining Greater Dublin Area (GDA) counties of Kildare, Meath and Wicklow there was a further 4,120 hectares. Most, if not all, of this land was initially zoned in the late 1990s and early 2000s and remained undeveloped throughout the Celtic Tiger period. For example, the 220 hectare Adamstown site in South Dublin was originally zoned in 2001 and was intended to provide 9,950 homes via a ‘fast-track’ planning scheme approved in 2003. Similarly, large greenfield tracts of land at Carrickmines, Clongriffin, Pelletstown, Phoenix Park Racecourse and Hansfield were all zoned well over a decade ago and remain undeveloped or only partially complete. 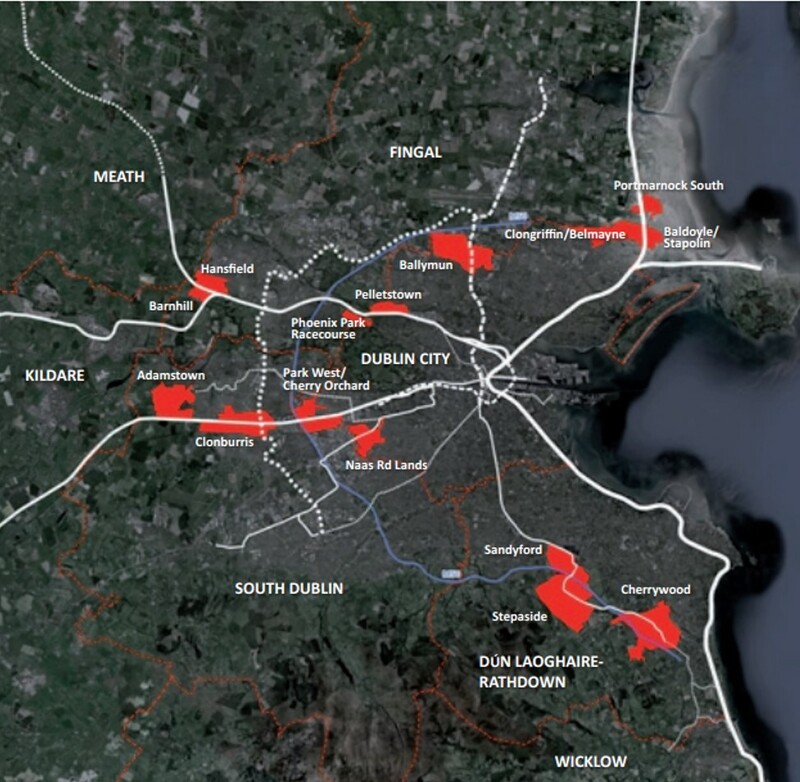 The figures above are exclusive of the abundant supply of brownfield development land, infill sites and mixed-use zonings readily available throughout Dublin and which could potentially have provided for tens of thousands of additional new homes. It is evident, therefore, that a deficiency in the availability of zoned land was not the cause of the extreme property price inflation in Dublin throughout the Celtic Tiger. Nor is it the cause of new housing undersupply today. The most recent 2014 residential land availability survey by the DoECLG shows that there are currently 2,654 hectares of ‘Stage 2’ zoned land available in Dublin i.e. lands which have been prioritised as potentially available for immediate development, much of it already benefiting from significant public investment in capital infrastructure and services. This is reported to be sufficient to provide approximately 117,000 new dwellings at modest densities i.e. 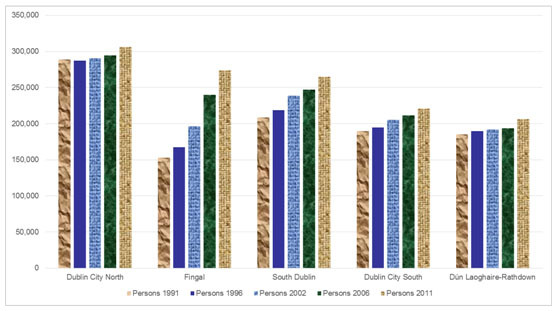 an increase in the total number of dwellings in Dublin by one-quarter. In addition to being zoned and serviced, many of these sites currently also have extant planning permissions. In the remainder of the GDA there is enough land zoned for a further 95,000 dwellings, while zoned residential land nationally could currently accommodate approximately 415,000 units (The DoECLG have even gone to the trouble of mapping the precise location of each of these zoned land parcels). Despite the vast array of evidence to the contrary, it is therefore remarkable how the notion persists, particularly amongst leading economists, that an obstructive planning system is hindering the operation of the housing market and was, and remains, a chief cause of the undersupply of new dwellings to meet demand. For example, earlier this week in his evidence to the Banking Inquiry the former chief economist of the Central Bank, Tom O’Connell, submitted that: “the demand mania for property took off against the background of restrictive zoning which limited the supply of housing, the inevitable result was huge property price inflation”. What this analysis also plainly overlooks is that the simple act of zoning land (colouring in a map) does not ipso facto result in an increased housing supply. Urban development is a complex and heavily capital intensive enterprise on both the supply-side (buildings, roads, sewers, schools etc) and on the demand-side (mortgages) and requires a functioning credit system, state intervention through public planning and a means to bring zoned land into production (i.e. to prevent speculative hoarding). While it may seem counter-intuitive to economists , it was in fact a massive oversupply of zoned land (Ireland had c.44,000 hectares of undeveloped zoned residential land at the end of the Celtic Tiger) that caused the rapid price inflation and poor spatial outcomes of the property bubble. Within Dublin, planning typically operated with a certain modicum of probity (albeit not without serious deficiencies), requiring that development on zoned land took place somewhat in tandem with physical and social infrastructure delivery. Outside Dublin local authorities generally had no such compunction, zoning land and permitting massive developments willy-nilly, including regularly on land with no zoning whatsoever. Facilitated by the shiny new radial motorway network and cheap credit, developers simply leapfrogged the suburbs and extensive hinterlands were turned into fields of gold leaving a disastrous economic, social, environmental and spatial legacy. Amongst the Dublin developer cartel, there were few complaints at the slow pace of real development as paper asset prices continued to soar. 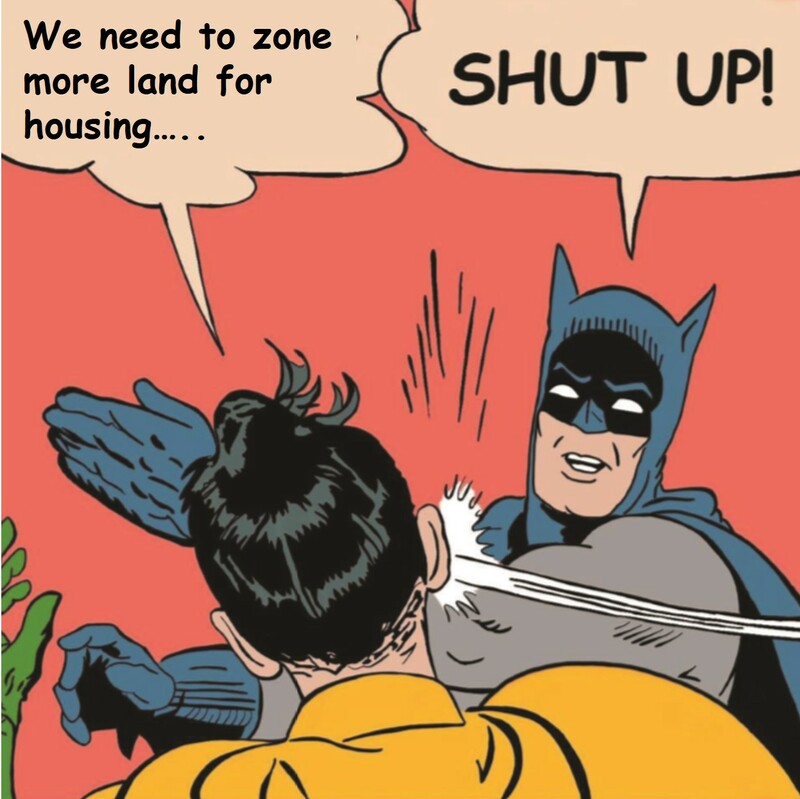 Ironically, had restrictive zoning measures actually been put in place and enforced in accordance with the National Spatial Strategy, it would have precipitated the early confrontation of the supply/demand/location problem – and history would have perhaps taken a different trajectory. Such problems were of course foreseen by the Kenny Report as far back as 1974. The solutions to today’s housing supply issues are not to be found in simplistic calls for more zoning. One of the curious outcomes of the relatively slower pace of development in Dublin during the Celtic Tiger is that we now have more than sufficient suitably zoned and serviced land available to meet current demand. 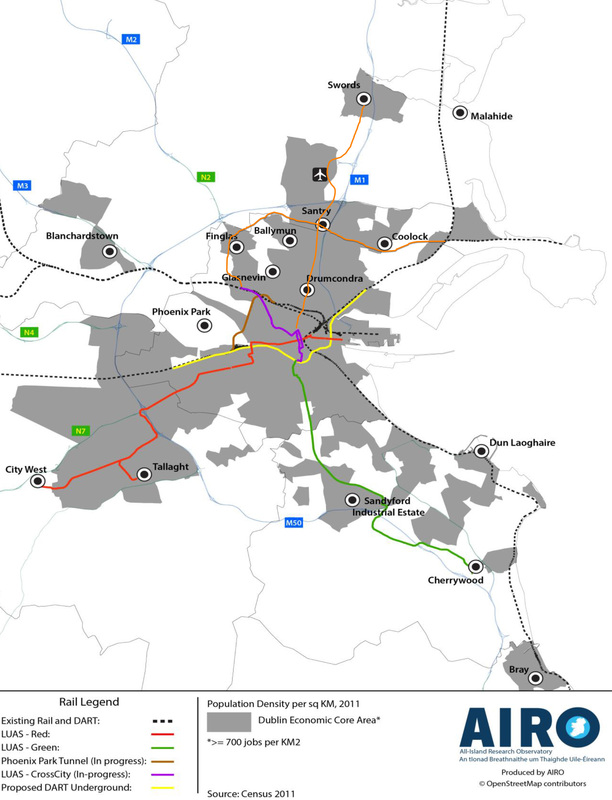 The National Transport Authority, for example, has identified strategic locations where thousands of new homes could be sustainably delivered focussed along rail and light-rail corridors. In a number of cases rail stations have already been constructed in anticipation of future development. What is needed is a means of prioritisation and to bring this land into production. Earlier this year, the Department of Finance launched a public consultation on precisely this question. The current Housing and Urban Regeneration Bill 2015 proposes the introduction of a vacant site levy to disincentivise the underutilisation of brownfield land. What is now also urgently required is the introduction of a similar Site Value Tax (SVT) as a recurring annual charge on all undeveloped zoned land as recommended by the Commission of Taxation in 2009 and by the ‘Thornhill Report’ in 2012. The numerous compelling arguments commending the merits of a progressive SVT have been well rehearsed elsewhere and McCarthy, of-course, will be well familiar with same, having previously written the preface for a notable book on the subject. We need smart future-orientated solutions to make best-use of available resources to solve Dublin’s housing supply issues and not a return to failed past thinking and the exclusively supply-side logic of the Celtic Tiger.